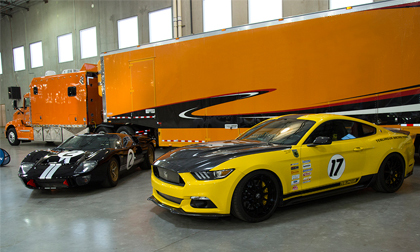 LAS VEGAS – Feb. 16, 2016 – For a limited time, anyone who sends their 2007-2014 Ford Mustang Shelby GT500 or 2015-16 Mustang GT for transformation into a Shelby Super Snake, Shelby Terlingua or Shelby GT by Shelby American, a wholly owned subsidiary of Carroll Shelby International Inc. (CSBI:PK) will receive an extra $3000 in valuable offers. Through April 30, 2016, customers can choose free round trip shipping to the Las Vegas factory from anywhere in the continental U.S. or a Katzkin interior upgrade with the purchase of an eligible Shelby American performance upgrade. Taking advantage of Shelby’s latest promotional offer is simple. Customers who purchase a Shelby Terlingua, Shelby Super Snake, Shelby GT or Shelby 1000 for the 2007-2016 Ford Mustang, will work with their salesperson to choose either free round trip shipping or a Katzkin interior upgrade (valued at approximately $3,000). The price of each package varies depending on customer package choice and additional upgrades. Note that the post-title package price does not include the base cost of the Ford Mustang. For more information, visit www.shelby.com, or contact Shelby American by phone at (702) 942-7325. Founded by legend Carroll Shelby, Shelby American manufactures and markets performance vehicles and related products. The company builds authentic continuation Cobras, including the 427 S/C, 289 FIA, 289 street car and Daytona Coupe component vehicles; it offers the Shelby GT, 1000, GT500 Super Snake, Shelby Terlingua Racing Team and GTS post-title packages for the 2005-2016 Ford Mustang. Shelby American also offers the Shelby Raptor and Shelby F-150 muscle truck. For more information, visit www.shelby.com.